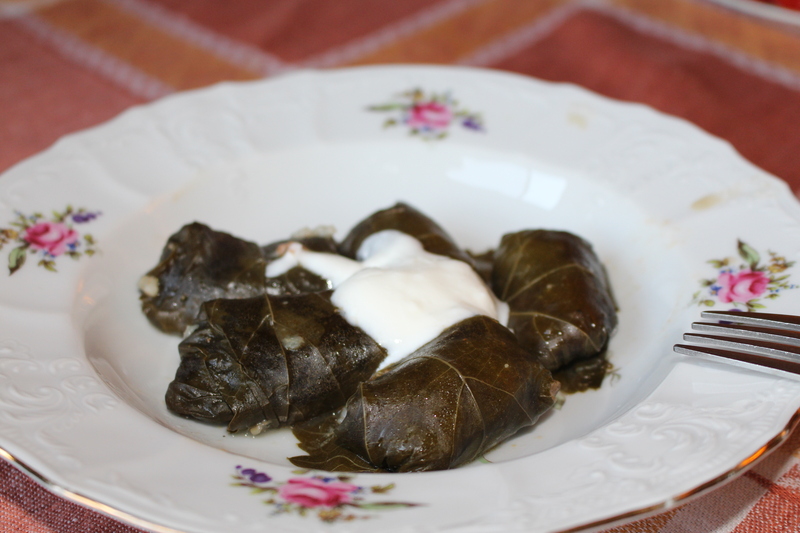 Today I want to post a recipe for a main dish, which we call Dolma. It’s hard to say what country is an origin of it, because almost every country in Mediterranean region has similar something. They differ a little, one from another, but idea is the same. 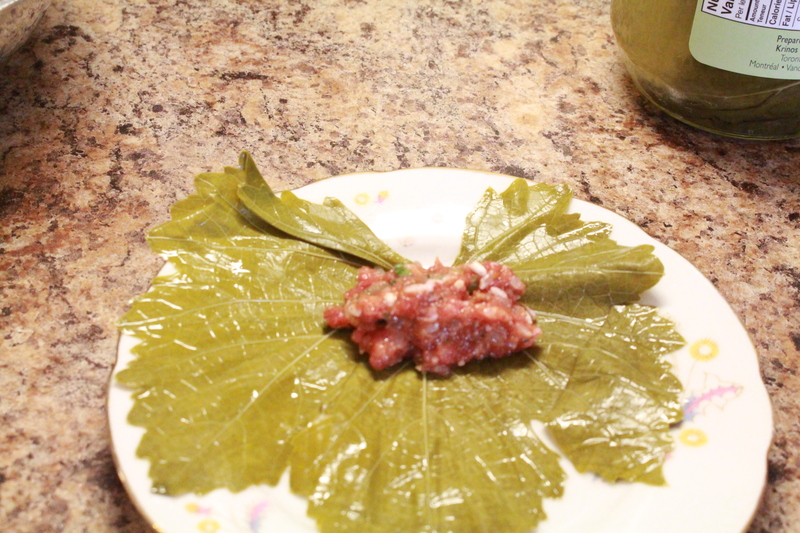 It’s basically vine leaves stuffed with filling. 10. Salt, black and red pepper. Ok, list of ingredients long, but when you have them ready, then is not difficult to make a dish itself. 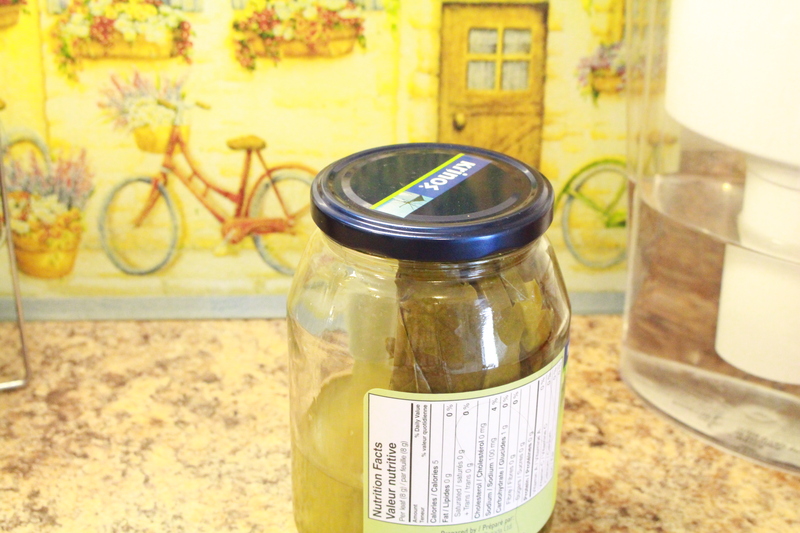 Remove vine leaves from jar and wash them properly in warm water, maybe twice. Sometimes there can be a torn leaf, which you cannot use. Just discard them. Don’t worry, you will still have enough to make your dinner :). Mix together beef, onion (chopped in food processor), egg, rice, tomato paste, greens and basil. Add salt and pepper ( just a 1 teaspoon of salt, and a pinch of each pepper). Then start adding a cold water, somewhere 3/4 of a cup. The mixture should be soft, but not runny. Now is the time consuming part 🙂 All you have to do, is keep a leaf on a palm of your hand and put beef mixture in the middle of it. Then try to fold it, first from both sides, then roll over, until the end. Try to make a tight roll. It is not that difficult, but you need a practise.Put rolled leaves in your pot, nicely covering from the walls to the middle. 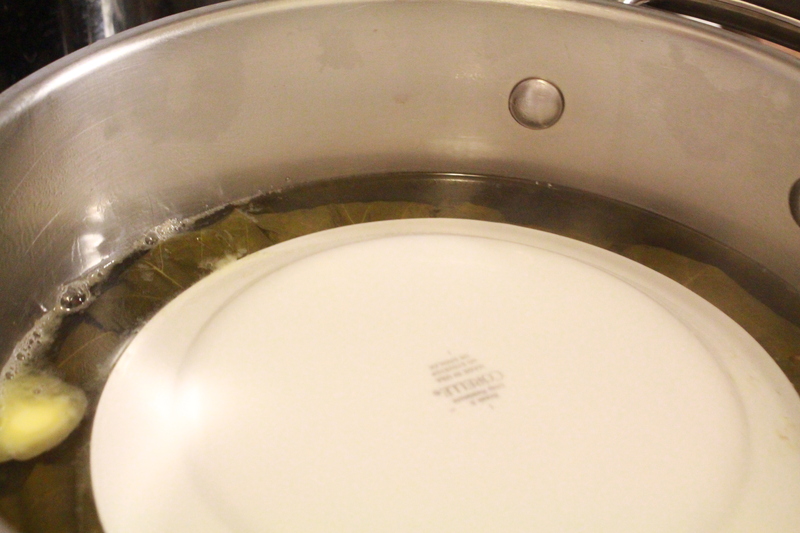 Layer over the layer… You don’t have to put them too tight, because usually rice need more space when it’ cooked. 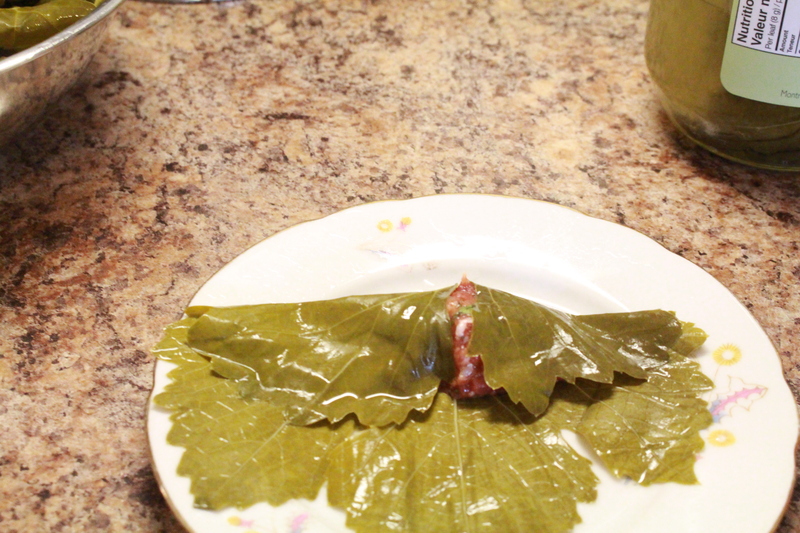 When you finished, pour over the melted butter, and cover your Dolma with a plate. You need this to keep them on a spot, when the boiling will begin. 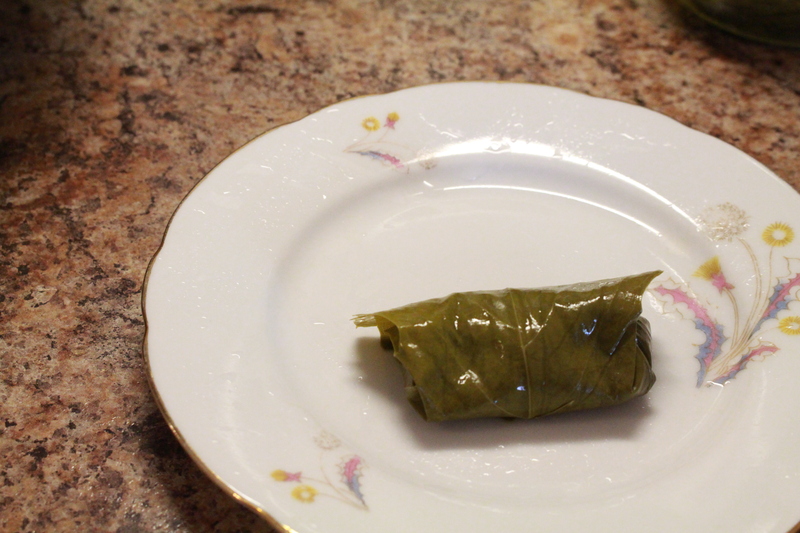 Boil the teapot and pour over the dolma, until they all covered and even give 1 inch more. Put on medium-high heat and cook about 50 minutes- 1 hour. To check if it’s done, take carefully 1 piece, wait until it’s not that hot and try. 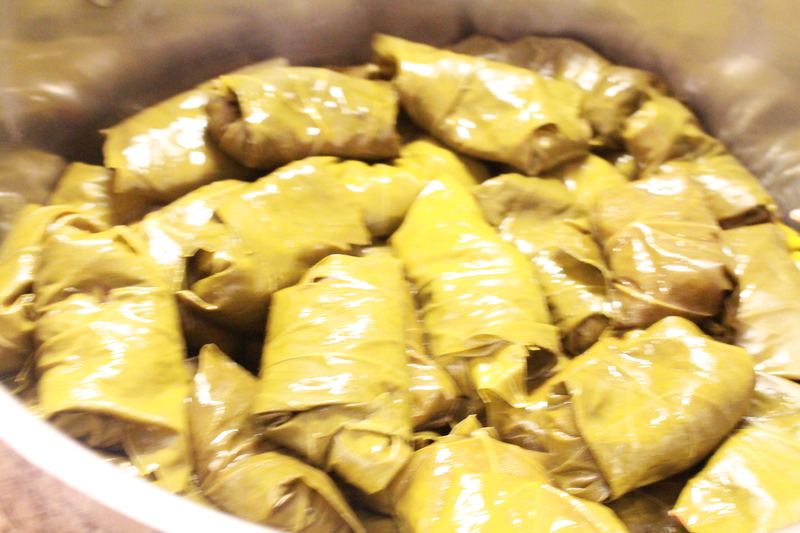 If rice is cooked , your dolma is ready !!! 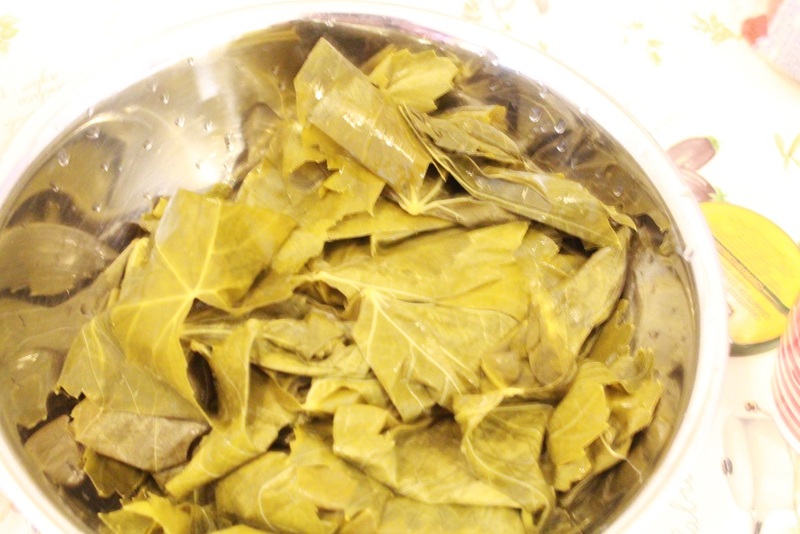 Make sure that your dolma always has a water in the pot, if it’s not enough just add a little bit. 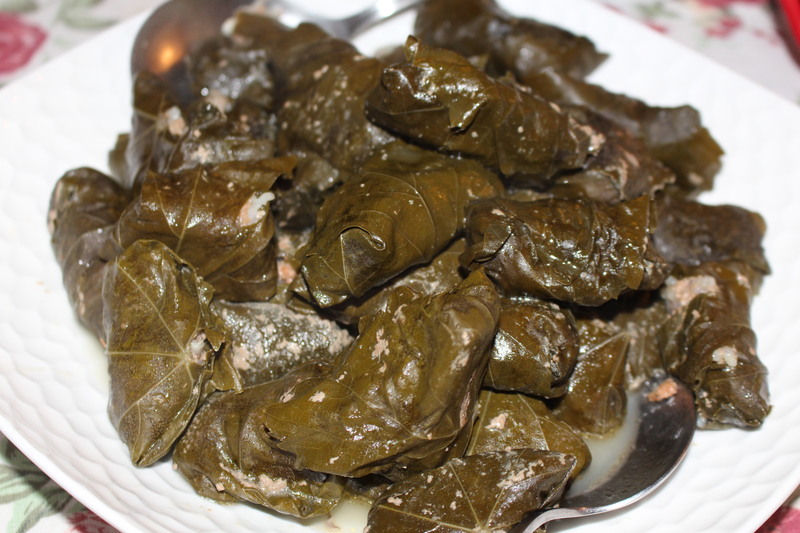 Now you need a dressing for dolma. You will need a plain yogurt (greek will be the best), and couple of cloves of garlic. Just squish garlic and mix with yogurt and it’s done. The result will be so rewarding, you can’t imagine!! !